for RealAudio comments by the composer, 2:54. 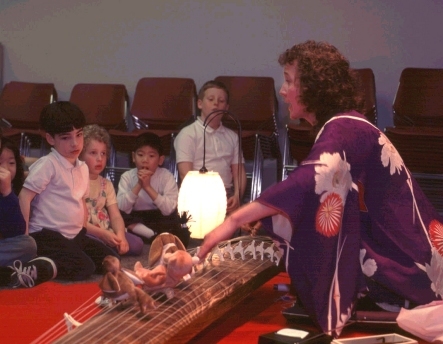 Koto Tales is a unique offering that I perform in both educational and casual settings. My first release containing a selection of these folktales with koto accompaniment, "Plum Boy! and other tales from Japan," received a 2000 Parents' Choice Gold Award as well as a NAPPA (National Parenting Publications Awards) Honors Award. My second recording of these musical adventures, "Hana and the Dragon," which was released in January 2001 was subsequently awarded a 2001 Parents' Choice Silver Honor. My koto and I perform the stories at programs together, often with puppets and lifelike stuffed animals now on permanent loan from my young sons. They stimulate the imagination and warm the heart....and my audiences like them too! I compose quite a bit for koto as well, having studied under Sawai Tadao and Kuribayashi Hideaki. A collection of my works entitled "Deep Pool" is available here. 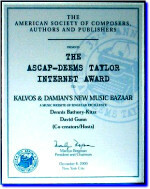 The music for many of my compositions are published by Dai Nihon Katei Ongakukai in Japan. I now perform and teach in the Seattle area, and direct the Taka Koto Ensemble, a non-profit group dedicated to promoting Japanese music. The ensemble has debuted several of my works in the past several years, some of which are featured on the "TAKA" CD. Please visit Other Collaborations for more information regarding my works with other musicians. I have written various articles on the koto and koto performers in newspapers, magazines, and periodicals. Some of these articles are available at this website. I have a B.A. in Japanese Studies from the University of Oregon, an M.A. in Japanese Pedagogy and a Ph.D. in International Education from the University of Iowa. But of all my educational endeavors, the most important has been my studies with Kazue Sawai at the Sawai Koto School in Tokyo, where I earned a master's license in 1990.